[Eric Merrell, Afterimage] In this painting I'm relying primarily on color to create form and dimensionality; the color here is intense but not very dark (and the intensity is created by relationships to other colors, not straight out of the tube color, which would be unrelated and garish). The round volumes of the persimmons can be felt even without much of a shadow, and the table surface has depth, warmer at the bottom/front edge receding to slightly cooler behind the leaves. Color has abilities above and beyond value. Is Value More Important Than Color? In seeking to position value and composition as more important than color in a painting, this quote sounds good but in reality is a disservice, and through its bumper-sticker witticism serves to confuse people. By implying that color isn’t terribly significant, that it's main purpose is surface decoration, we are lead to believe that as long as the values are right, the color can be relatively close to what’s expected and be o.k. (the blue sky, the green tree, the brown hair - i.e. boring). But theories (and bumper stickers) tend to reduce things to catchy oversimplification. Of the two, color is most important, since value, relative lightness or darkness, is a quality of color. Color communicates lightness and darkness, but also quality of light, mood, atmosphere, emotion, spacial qualities, season, time of day, temperature, surface quality, and more. Color can encapsulate everything in each related spot. Color is the whole package, but value can only convey light or dark. Color is poetry. The idea of the importance of value over color comes from the academies and historically, from ideas about what color is. For a long time artists began their paintings by working first in value. Removing the complexities of color from the early stages of a painting simplified this approach (grisaille in artist terminology) and allowed form to be achieved quickly as the artist worked in gray tones. The artist subsequently added color, either transparently by glazing or opaquely by repainting it directly on top. "Color adds ornament to a painting; but it is nothing but the handmaiden, because all it does is to render more agreeable the true perfections of the art. Rubens and Van Dyck can be pleasing at first sight, but they are deceptive; they are from the poor school of colorists, the school of deception. Never use bright colors, they are anti-historic. It is better to fall into gray than to into bright colors." "The enemy of all painting is gray." Art was forever changed by the insights of Sir Isaac Newton (in particular, his prism experiment showed that white light contains all colors) and Michel Eugène Chevreul (simultaneous contrast). As would be seen in work by the French Impressionists as well as the Pointillists, artists modified their palettes to accommodate this new knowledge, but these insights are not well understood today. One indication of this is the continued belief in 'local color’ - there is no such thing. The advent of new groups such as Synthetism and Cloissionism, which were created in reaction to the Impressionists, were built up around various color theories. Paul Gauguin was the main proponent behind the former, while Émile Bernard and Louis Anquetin are credited with the latter. Working alongside Gauguin in Brittany, Bernard also admired and corresponded with Vincent Van Gogh and Cézanne. Bernard did some interesting work but the theory often took center stage - with Cloissoinism, he desired to simplify nature and reduce all perceived colors into the seven main colors seen in a prism. Indeed, Cézanne complained that Bernard theorized too much. "Color does not add a pleasant quality to design - it reinforces it." This rivalry about the role and application of color goes back hundreds of years and has its roots in our earliest ideas about color. St. Bernard of Clairvaux (1090-1153), a French abbot and integral part of the Cistercian order, agreed with a strongly held assertion that color was purely matter, and that it should be avoided because it disguised and masked the holy and pure. Accordingly, St. Bernard's churches contained little or no color, tolerating none of the deceptions that (as St. Bernard believed) color would present to lead the faithful away from religious thought. A contemporary of St. Bernard, Abbot Suger (1081-1151), took the opposite view. He believed that color was light, and since light was immaterial and came from God, color was good. Anticipating Newton's discoveries by a few centuries, Suger's abbey at St. Denis reflected that concept: filled with stained glass, gold, gems, and enamel, all color represented and glorified God. I isolated some of the color spots from their roles in the painting for the sake of comparison. If we are asked, what do the words red, blue, black, white mean, we can, of course, immediately point to things which have these colors. But our ability to explain the meaning of these words goes no further. Color – it’s hard to see, difficult to understand, and maddeningly complex to explain, especially when our understanding of it changes over time. St. Bernard believed that color disguised a more 'true' world. Over the centuries prior to Newton there were myriad other ways of understanding color. The Greek philosopher and poet Empedocles, whose writings were later a source for Plato and Aristotle, claimed that rays of visual flame left our eyes like a lantern, while simultaneously, objects in the world continually emitted 'effluences.' These effluences existed in different and various sizes; when they corresponded to similar shapes of pores in the eye, we saw color. But we know now that color is energy: the universe is full of an immense amount of electromagnetic waves bouncing around. Our eyes and ears, in concert with our brain, interpret some of that energy into 'sight' and 'sound.' We can only perceive a very small range of these waves, what we know as visible light. Take away the light, and you aren't left with shades of gray; you have darkness: the absence of light. A landscape under the light of a full moon is not monochromatic, a limited amount of color can still be seen - as a starting point, go outside at night and look around - the sky will be a different color than the ground. Even the near darkness of a quarter moon is not black and white. In these situations where light is reduced almost entirely, we can still see color. 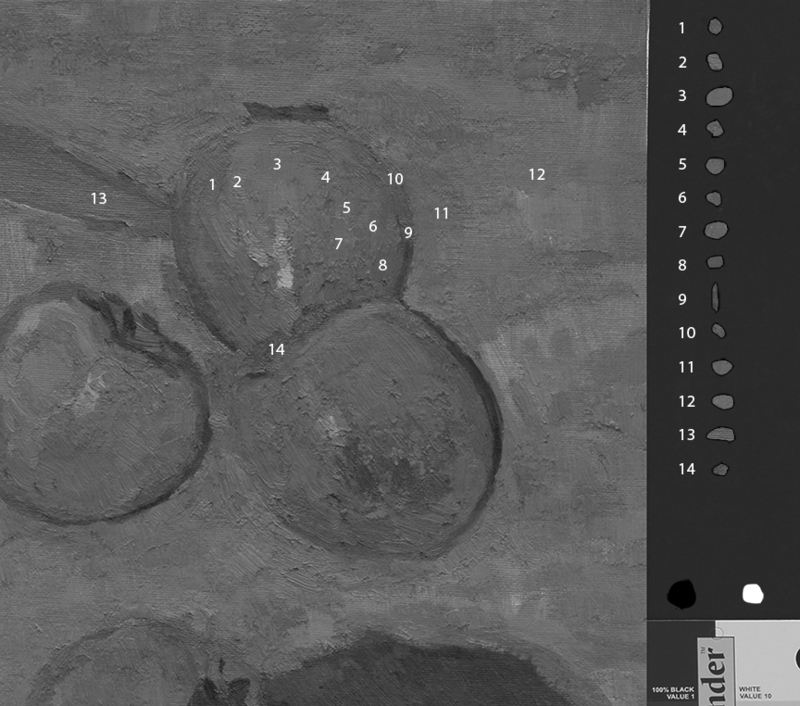 Detail of the color spots isolated and their location in the painting. The same image converted to grayscale. Isolated spots in gray scale and color. In the spots above, variety in the color version is fairly distinct albeit subtle - some are a little more yellow, some a little more blue or red. Taken into gray scale, the broad difference between 12 and 13 becomes nearly nonexistent; the subtle qualities between 5, 6, and 7 disappear. #9 is the edge on the persimmon as it turns away from us, seemingly a 'cool' color in the painting; isolated, it loses its power. If you take half of the gray scale version of spot 5 and overlay it on spot 11 (see offset spots above), they're indistinguishable. But color-wise they serve very specific roles in the painting: 5 is maybe a little warmer, part of a rounded form of persimmon, while 11 resides on a flat surface. Value is a helpful, albeit limited, tool. Here’s why. Sure, we can achieve form through value. But let’s say you’re painting that simple sphere above. If you’re looking at and painting an actual sphere on a table in front of you, you’ll notice the cast shadow (x) close to the sphere will probably be darker but will lighten somewhat as it moves away to the left. Not only will it get lighter, but the color will change. If you’re working only in black and white paint, the only adjustment you can make is to go lighter or darker. You can’t make it redder or bluer or greener or warmer or cooler. With a limited palette you have only very limited color adjustments possible, and quite likely not what you’re seeing. You’ll notice the same thing happens in other areas - the color will shift along the top edge (y), as well as within the darker core shadow (z). The spot marked by (a) is the part of the sphere that is physically closest to us, the viewer. Every other part of the sphere is receding away from us. The spot where the (z) is placed within the core shadow is the part of the core shadow that is closest to us. As the dark line of the core shadow recedes up and over the sphere away from us, the value may or may not change, but the color most definitely will. Otherwise the far top edge of the core shadow will read as being in the same space as (z). The reason mountains look bluish at a distance is because of atmospheric perspective - the amount of atmosphere between us and the object we’re looking at affects the amount/quality of light (i.e. color) that can pass through (also the reason why sunsets appear warmer/reddish). In our little sphere still life we don’t have the vast distance of a faraway mountain, but we still have small amounts of atmosphere to account for. Because of atmospheric perspective, we know that everything that recedes away from us gets lighter (value shift) and cooler (color and/or temperature shift). (The opposite of darker/warmer makes things come closer.) For the sphere to sit like a volume in space and convey a sense of light, we need all of our color relationships to reflect these basic ideas. Value can only get us part of the way there. If the color changes but the value stays the same, we have no ability with value to create dimension. Value can’t move laterally, it can only go lighter or darker. That area remains flat. Color can be adjusted and shifted infinitely within the same value. It can be greener, bluer, tending cooler towards violet, shifting towards orange, getting a little warmer. Color can convey form, but also quality of light, depth, atmosphere, spacial qualities, mood, emotion, season, temperature, surface quality. Color is poetry. Hardly mere ornamentation. When you see and paint a single spot of color in relation to others, that single spot can convey light, depth, emotion, form, temperature, and more, all in one mark. It’s sounds easy summed up that way, but it’s so incredibly difficult. Value is a component of color. Color is the whole package. If you get the color correct, the value will be correct. Remember, value doesn’t exist without color. Pure black and white is a reduction of reality. When we talk about value, we are indirectly talking about the lightness or darkness of color. [Eric Merrell, Self-Portrait at Sunset] Color has infinitely more possibilities than value. Although here we see a great variety of color, compare them to the value scale in the middle - a large portion of it is mid-range, with nothing extremely dark or light. If this were painted in grayscale we might be tempted use extremes of value to convey contrast because that’s the only ability value has. The orange hat, blue-green background over the shoulder on the left side, and shirt in sunlight are very different as far as color, but are about the same value-wise. We only see the value at right when all of the color has been stripped away. If the color is right, the value will be right. Color is specific. Don’t disregard color in favor of value. [Eric Merrell, A Flash Through the Gloom] The orange persimmon piece above has lots of little color shifts in a similar color scheme. In this painting and the self-portrait I’m relying on bigger color shifts within a close value range. The yucca in the lower foreground is just about the same value as the first and second hills, but the color is dramatically different. Although painted at twilight, there is nothing truly dark in the painting, and the moon isn’t just a white cutout. [Eric Merrell, Distant and Dreamlike (The Salton Sea)] Samples of the lightest spot (x) and the darkest spot (y) along the value scale. A very high key painting that needs color to work - with only gray tones, that distance of a few miles across the Sea flattens out to the picture plane. Value can’t move laterally within the same value - color can. Another common misconception: if a value is 'correct' in a painting, the color can be somewhat arbitrary and still work. The opposite is true: if a color is right, the value will also be right. Each color spot must relate to every other color. Color is specific. Don't disregard color in favor of value. The world is not merely black, white, and gray. We live in a world packed full of colors - of tens of millions of colors. Black and white as an art form can be beautiful, as it is in photography and printmaking - but it’s a distillation of reality as far as painting goes. Learning to understand value and composition is obviously very necessary for learning how to paint, but the road to color continues way beyond value. As artists we’re attempting to translate the tens of millions of color we can see - perceived light - into the much smaller range of pigment. The strongest palette of artist’s pigments will always fall short of representing our perceptions, but I think it’s far better to have a bigger keyboard on which to play. Discussions of color tend to become dogmatic and formulaic (color wheels, opposites, etc,) because we want to it fit into a system of measurement like perspective or anatomy, but color resists that kind of organization because it is a personal experience that happens in our brains. (Value is another measurable system.) The amazing part of color to me is that, although its such a personal thing, if we get the relationships to work, others will understand it, even and especially if they have no artistic background. If we limit ourselves to relying primarily on value contrasts, we will tend to paint only when value is visibly present and quite often come up with pedestrian color. Value is just color with the difficulty removed. If we accept a full range of color, possibilities open up: we can paint in the middle of the day, on overcast days, or in any number of other situations - even at night. 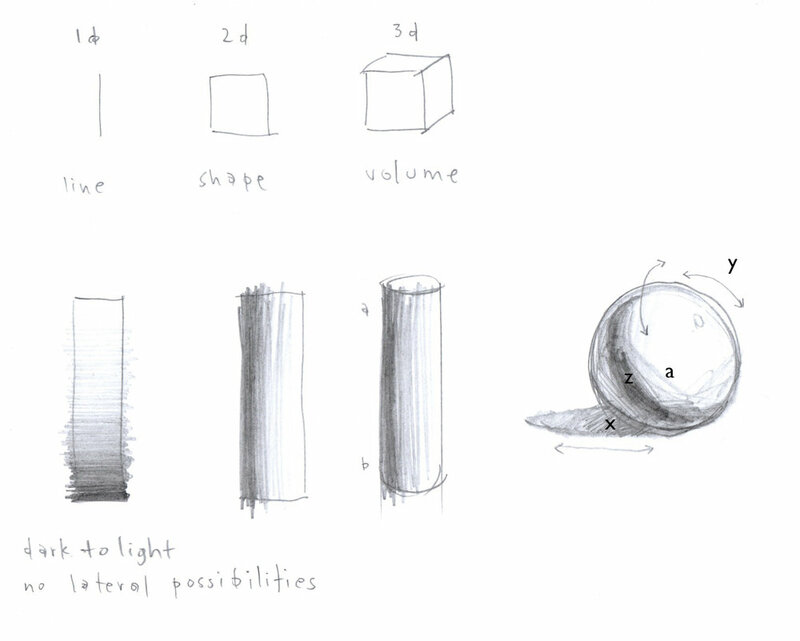 The world remains three-dimensional, regardless of the light or time of day. Don't waste your time and money on color theory books*; most just regurgitate theories without presenting any new insights. There is no easy way to good color. It’s hard, toiling work. Don't worry about explaining your color; people always want to know why a certain color exists (i.e. they want you to present some science as to why your tree is red or that face is violet). That color exists because you saw it and put it on canvas. Learn to paint by learning to see. Paint outdoors often. Paint what you see. Be bold with color. Excellence in color is rare, but despite its degree of difficulty, it is achievable to those willing to work hard enough (years and years, and then more years) to understand it. Let's strive to move beyond the predictable color of weekend hobbyists and the formulas of art workshops. Avoid prettiness and search for beautiful color - you will surprise even yourself. The point is this: Value is important, but don’t let that contrast become the only one you use. If you’re interested in learning to see and paint, check out my Workshop Schedule. *For further reading, these classics will never get old. They deal with color not in terms of theory but in terms of seeing, which is what painting is. How often have you heard someone praising a painting because it looks just like a photograph? The purpose of painting is not to replicate a photograph. The point here isn't that it's bad to use photo reference - but the secondary work shouldn't look as if you did. Today, we see most of the world through other people's realities or through our own digital means. We know more about social media than the world immediately in front of us: T.V., billboards, magazines, and ads influence so much of how we see. Because of this, society has come to believe that these images are in fact reality, and objective reality to boot. Nothing could be further from the truth. The images they produce might be more 'rendered,' but they're designed to tell a story. Cameras focus and reduce our visual world. We can see over 10 million colors in the visual spectrum; digital cameras instantly distill that vast range into a system of RGB (red, green, blue). (Film cameras are a different process altogether, but still a system.) Printed images take this a step further, converting that RGB system into CMYK (cyan, magenta, yellow, black). These systems make images that represent our world to a certain extent, but they reduce our three-dimensional sensory experience into a two-dimensional format based on one instant of one sense. "A picture is worth a thousand words" goes the phrase, but those words are going to be merely documentary, which is why an article is usually accompanied by a photo and vice versa. You won't understand a story about someone merely from looking at one photo, but a photo gives us info that we wouldn't glean just from reading. Here's an example of how misleading photos can be: say I show you a photograph of a guy smiling. Then I ask: What can you tell me about the guy in the photo, does he seem like a happy person? You might reply that sure, he looks happy, based on the evidence. What if I then said this was the only time in his entire life that he smiled, this one time for a photo? We don't have any photos of him frowning, but he was a really unhappy fellow. The photo only documented the immediate moment he smiled, but if you were to make a judgement about something other than what's seen in the photo, you have no way of knowing. Painting also reduces that 3d experience into a 2d format, but because of the slower speed of making a painting the artist has more opportunities to experience, translate, add and subtract. If you think of great art, or your favorite painter, chances are they're not painted 'like a photograph' - but there is still insight and truth to them that makes them invaluable to us. So painting and photography are similar in some ways, but one is no more objective than the other. The physical way in which we see, coupled with all of our other senses, is our reality. Our personal realities determine our perceptions, relationships, understandings - everything. An image produced by a lens (and often distorted by that same lens) is very different from our own binocular vision. It also makes photography that much more special as an art form; a subjective viewpoint, created by an artist. Many people would judge portrait painting to be more difficult than landscape painting because of the need to get the features right. Anyone would notice a nose in the wrong place; it would seem to matter much less if a tree is planted five or fifty feet away. However, to an experienced landscape painter, it is immediately obvious if someone is using photo reference for a landscape. The purpose of painting is not to replicate a photograph. A photo contains certain value and color relationships that most artists will copy because they don't understand how natural light works. This is obvious even if a painting isn't highly rendered. Painting and photography should enjoy the same separation that church and state do. Not walled off completely, but separate things with unique identities. We're a society that's inundated by digital images. And it's perfectly fine for painting to reference that. However, we all know that world. For myself, I want to make work that shows something mysterious and new about the world, not something that confirms what everyone already knows about it. I want to make work that piques interest when seen online, but when seen in person has even more impact - I want it to carry qualities that are not reproducable in digital formats. Art Business: Yawn, right? Still, I think it's important enough to write about. Of all the artists that I know, the successful ones (read: make their main income from art) are totally involved in the business side of their art, not just the creation of it. The romantic stereotype of the messy artist who just creates in a cluttered studio is really the image of an artist who won't survive. I want to stress that this is offered equally towards Artists and Galleries, but is written from the artist's (my) perspective. Artists should realize that each of their business decisions, even on a small scale, affects other artists and the art world at large. An Artist-Gallery relationship is a lot like a marriage. You should spend a lot of time asking questions and getting to know them before making a commitment. Artists need to make it clear what they want, listen to what the gallery wants, and then work with the gallery to make that happen - don't just sit back and wait for the checks to roll in. It doesn't work that way. I've worked behind the scenes in a handful of galleries before, so I can easily sympathize with owners, and I know how problematic and difficult living artists can be by missing deadlines, being unresponsive, etc. Think how much consignment forms would streamline everything! If I owned a gallery, I wouldn't do business with an artist who didn't use them. 1. It protects both parties involved. If you were consigning any other physical object for sale, such as power tools or furniture, wouldn't you want to have something signed as proof that the agreement actually exists? Fedex and UPS have you sign to verify receipt of a package. Otherwise, how do you prove that the exchange ever occurred in the first place? Art is always talked about as a commodity, but so much is often agreed to by handshake alone. The gallery could have purchased it separately from a third party. As my uncle says, a contract is as good as the paper it's signed on. Meaning, no contract, no good. Get it in writing. Plan for the worst case scenario, and create a consignment form and agreement that will prevent you from ever getting there. I have heard horror stories from other artists: galleries that closed and the consigned artwork (consigned = the gallery does not own) was confiscated as payment for debts by the gallery’s creditors; galleries that didn't pay what they agreed to pay when selling (discounts given); galleries that denied work was ever even given to them or somehow lose paintings. I've also heard artist horror stories from the gallery side of things, too, so why wouldn't both sides draw up a fair agreement that protects everyone? 2. It keeps everyone involved happy. Because the artist and gallery are all on the same page at the outset and have the same understanding of the agreement, misunderstandings have much less chance of occurring. 3. The art world is in reality a small community. If an artist sets certain precedents in a gallery relationship, good or bad, that affects other artists who come afterwards. If an artist accepts lousy commission rates just for the sake of a wall to hang on and a little ego, the gallery will continue to use those lousy rates because they can, and that artist has now made it harder for every artist who comes after him to get a decent agreement. If one artist walks away from what they perceive as a bad deal, but the next ten artists agree to it, nothing will change. But if one artist walks away from a bad deal, and subsequent artists do too, that sends a message to the gallery that maybe they need to change something to get the good artists in the door. Artists need to stick to their guns, or be prepared to walk. 4. It creates a record. Of your work, your exhibition history, your collectors. This is provenance, which determines authenticity later down the road. And the art historians will love you. 5. You know where your work is, and how long its been there. Obviously art is not the same as a loaf of bread at the grocery store that needs to be replaced after a few days, but it's a good idea to refresh your work in a gallery from time to time. Collectors like to see something new and it's a good way to stay involved with your gallery. If you don't have some sort of record of these things, and have multiple paintings out at multiple galleries, it's very easy to forget how much something was priced at, or what size it was, or how it was framed. Documentation is your friend. 1. 50/50 is not a good deal. Artists, you should be insisting on at least 60/40. I can't say this enough, and I can already hear the galleries complaining, but hear me out. Artists have rent/mortgage, utility payments, car payments, grocery bills, and more, just like gallery owners, as well as the upfront costs of paying for all the materials to create something (paint, canvas, stretchers, etc), the time spent to create it (often many more hours than you know), plus framing the artwork and shipping it to the gallery. What about airfare to get the artist to the opening reception? I know galleries have other expenses. However, Galleries tend to represent multiple artists, often upwards of 40+ at times, while artists tend to be represented by, let's say, 4-5 galleries. So, even if a lot of the artists represented in a gallery aren't selling, chances are good that a few are, and the gallery will be earning income from that. Even with 4-5 galleries, there is still a good chance that an artist will go for long periods of time without selling anything. If galleries would purchase some of the work outright from an artist like they used to, it would be an immense help. Years ago when an artist had an exhibition, a gallery might purchase 1/3 of the new work. What about even one or two pieces? Not only would this give the artist the ability to continue to survive and create, but now the gallery is really invested in selling the work, because they own it, rather than having no horse in the race as is the case with consignments. Step 2: Divide the Adjusted Retail into the previously agreed commission rates. A 60/40 agreement would give the artist 60%. Now, a gallery might be paying for a few other things like magazine ads or exhibition brochures - these are definitely expensive, and the artist probably never sees the cost of any of this. This then is a negotiating point at the outset of the relationship - who pays for what? Does the artist pay for frames and shipping to the gallery, while the gallery pays for x number of ads per yer? Lay it all out on the table and agree to it beforehand. 4. You can always say No. Artists - if you're not getting what you're asking for, or feel like you're compromising just for 'exposure,' you can ALWAYS say No and walk away. Maybe it would be better NOT to sign on with a gallery; instead regroup and work on strengthening your art. Don't be hungry for 'representation' or 'exposure.' Make your art your best ambassador. So you start to see why artists might seem so crazy - we have to manage not only the creative side, protecting the playful child-like approach, anticipating and responding to new experiences in order to create, but we have to balance it with the responsible, grown-up side of doing business in the art world. Add to that a preponderance of galleries that jump at the first mention of 'consignment forms," and it can be precarious at times to maintain those two worlds and yet not have them influence each other too much. Like I said at the outset, I'm hoping this improves Artist-Gallery relationships, puts more out on the table and up for discussion. If you want something, ask for it. Also, listen for (or ask if you don't hear it) what the other party wants or needs. Stay involved. If it doesn't sound like it will work, there are plenty of galleries out there. OK, now I'd love to hear from you. Are you an artist? What are you experiences? How about galleries? Do you have something to add that I might have missed? Let's start a discussion about this and make it the norm for every artwork to be accompanied by a consignment form. *Want the nitty-gritty? Here's the 1909 CA law requiring Consignees (Galleries) to give the name AND address of the Purchaser (Collector) to the Consignors (Artist) upon request. Stats. 1909,c. 706.p. 1081, Section 1. 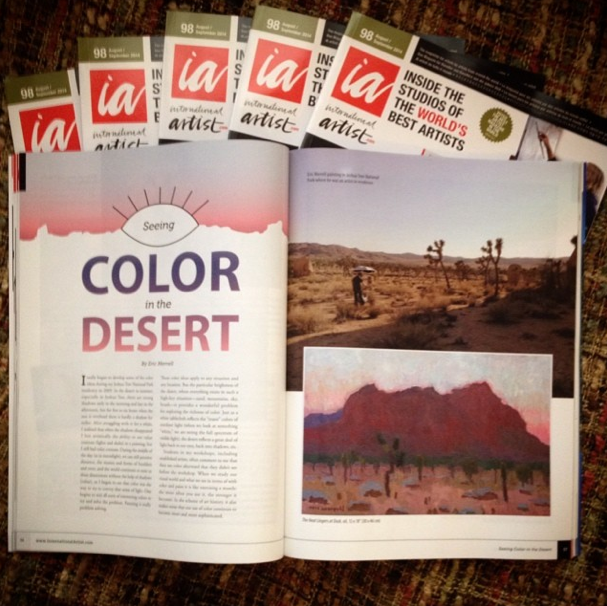 My article Seeing Color in the Desert (originally posted on CaliforniaDesertArt.com) has been reprinted in the August/September 2014 issue of International Artist magazine. It originally started with notes from my sketchbook about what I was observing while out painting, and what to do about certain problems that color posed or provided a solution to. An Interview with Eric Merrell Discussing His Salton Sea Haze and Gustav Klimt's (1862-1918) Attersee, 1909 by Stephanie Campbell (Summer 2013 issue, CAC Newsletter). STEPHANIE CAMPBELL: When did you first learn of Gustav Klimt, and how did he and his work impact you? ERIC MERRELL: It was in my early college years, while I was at The University of the Arts in Philadelphia that I first learned about Gustav Klimt. I was initially introduced to his figurative work, which is what he is best known for, but a few years later I cam across a book that was specifically dedicated to Klimt's landscapes. Immediately, I was intrigued by his use of color and shapes, and found his landscape compositions innovative and fresh. SC: Can you tell us a bit about Klimt's era? EM: Klimt was classically and conservatively trained at the Vienna School of Arts and Crafts where he focused on architectural painting. His career began as part of an intimate group of painters with his brother, Ernst, known as the "Company of Artists." The group provided him with important public projects including interior ceiling murals in large buidings on the historic Ringstrasse in Vienna. One of his most successful series was the "Allegories and Emblems." Some years later he became one of the founding members of the Vienna Secession movement. The secessionists were a group of many different kinds of artists who were trying to find a bigger and newer voice, but not necessarily with the purpose to get rid of the tradition. They were just trying to find their own place in the art world. SC: How do you classify yourself as an artist? EM: That's hard to say. I feel an affinity with the California Impressionists and also with some of the Romantics, but I don't know if it's completely accurate to place myself in those categories. The title "Romance of the West" that American Legacy Fine Arts gave to my summer 2011 exhibition was very apt. Romance in the classic sense is missing from the contemporary art world, and I think that is a big part of what my work is about. The ideal American West, pulling oneself up by your bootstraps and making something out of an opportunity, is something that I feel is lacking today. SC: What ultimate effect would you like to have on society as an artist? EM: I want to show that there is still something new that can be said with painting. I want to paint subjects they may have otherwise not thought of as being paintable. I find myself avoiding "traditional" perspectives of landscapes and digging a little deeper. For example, some of my latest interests have been painting right at dusk and during the middle of the day, periods which many artists refer to as "flat light" as there are no shadows to use for contrast. Of course, the world doesn't change from 3-dimensional in the morning to 2-dimensional at noon and back again in the afternoon - these situations are all paintable, they just need to be approached differently. I have also found that nocturnes provide a lot of room to explore artistically. In these types of situations I find I can solve some of these problems by playing with abstractions, shapes, and color. By doing so, I hope to show people how to see things from a different perspective. I truly enjoy taking a very traditional scene and making it my own, as Klimt did. SC: How would you compare your style to that of Klimt's? EM: Our color sensibilities are different, as is with every artist, because color becomes a very personal thing. Our training is also very different; he was trained under the much more classic academy and atelier style, whereas my education was (initially) based more on commercial illustration. Despite these differences I feel a kinship with Klimt. I can relate to the way that he saw the world. He didn't just do landscape for landscape's sake, he was doing something more unique with it. SC: How do you think your painting Salton Sea Haze and Klimt's Attersee are similar and how are they different? EM: Though our color sensibilities are different, our palettes are similar in this case where our use of colors are in the same family, such as the silvery violets and the cooler sea greens. I wasn't familiar with Klimt's painting, Attersee, until after my wife Ramona, went to Austria and saw it in the Leopold Museum. She emailed me a picture of it, because she thought the similarity (including the square format) was uncanny to my Salton Sea Haze. Despite how similar the tones are, the paintings are climatically different: Attersee depicts the cool damp European climate while Salton Sea Haze shows the dry heat of the southern California desert. SC: What do you find particularly interesting about the Salton Sea, and what do you think Klimt saw in Lake Attersee? EM: I've become more interested in temperature and color contrasts, beyond value contrasts, and because the desert lends itself to those qualities I often paint there. In particular though the grand scale of the Salton Sea and the fact that not a lot of artists have explored it as an appealing subject matter, gives it a pioneer aspect. It also has a bad stigma to it (drug trafficking, dead fish, and abandoned trailer parks) but I want to show the beauty that is there that people don't think about. The feminine aspect of depicting a body of water is what first comes to mind with Klimt as inspiration for Attersee, as his work often featured women. There is also the challenge of painting a body of water, Unfortunately most of what we are taught about Klimt relates to his figures, historically his landscapes and the inspiration behind them have received little attention. SC: How would you compare Klimt's landscapes to his figurative work? EM: They all have a mosaic quality. A 2006 LACMA exhibit of Klimt's work had a few figures and a few landscapes. The exhibition allowed people to see that although the subject matter is different in the paintings, there is a lot of crossover between the two areas. His landscapes may have been more of a breath of fresh air to him, because most of his figures were commissioned works, which meant dealing with individuals and committees, while his landscapes would have been painted by personal choice. SC: What in particular attracts you to Klimt's Attersee? EM: There is something about this painting that always seems to retain a certain freshness; it's one of those paintings that you can keep looking at and it never gets old. It has a contemplative quality that can put you into a meditative state. SC: Do you think that you and Klimt were trying to achieve the same visual effect? EM: I feel like he was honoring traditions, while still using his own voice and creating something different. I hope that is something I am also achieving. I'm in this funny position contemporarily where I feel as though I'm more modern than a traditionalist, but I'm too traditional for the modernists. Somehow, I like that. SC: How directly do you think Klimt's style has influenced you? EM: I don't think his style has influenced me so much, but it's rather the way he sees things in simple shapes and design. Our textures and brushwork are different, but the way he views the world and translates that onto his canvas has had a big impact on the way I see the world. SC: How do you feel Klimt has influenced other contemporary artists? EM: Klimt was so unique in his own way that it is hard for people to be directly influenced by his work without having their work inadvertently look like his. Indirectly, I think that he has influenced contemporary artists such as myself in a way that inspires us to follow our own voice. Why should an artist paint on location? How do I know what to paint? How do I create personal work that stands out? I hope you'll join me for a few workshops that I'll be teaching this October in the Pasadena area, and we'll work on answering those questions. I'm especially looking forward to the Seeing at Night class, as we'll be focused on how to paint on location at night. I think this will be unique, as not many artists work on location to paint nocturnes - I'll show my approach that allows you to see REAL subtlety and color, not invented color. And if you've been following my California desert workshops, I've just scheduled the 3rd Annual workshops for both Anza-Borrego and Joshua Tree. There aren't many workshops taught in either place, and my experience painting on location in the desert will help to bring the classes to great locations and have a great experience. Shadows Between the Sky, 16" x 20", © Eric Merrell. This painting was conceived solely from thumbnail sketches, written color notes, and observations from the landscape. MICHAEL: Hey Eric, Your work is cool. First off, what is it about plein air painting that appeals to you? ERIC: Hi Michael, I grew up camping with my family, so have always had a great love for the outdoors. I like to visit places and immerse myself in them – I look around a lot and compose mentally while exploring. Often when I’m on a painting trip, I’ll read about the location in the evenings after painting – history, geology, legends. Being on location gives me the opportunity to know the place better and to discover why I’m going to paint. Painting on location continually presents challenges that keep me engaged. MICHAEL: There's a lot of landscape out there. How do you determine what you'll try to capture on canvas? What's your process? Continue reading the interview here. 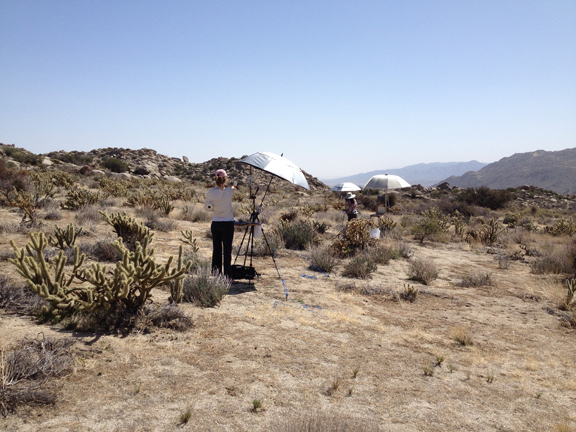 I've just returned from an action-packed painting trip to Anza-Borrego Desert State Park. Up until now I'd never been to this part of the California desert, located west of the Salton Sea and on the southern side of the Santa Rosa Mountains from Palm Springs. Interestingly, I don't think that many people in Southern California have ever heard of it, despite its being the largest state park in California. It's remoteness is probably a big reason. Historically, this area was frequented by San Diego-based artists such as Marjorie Reed and Maurice Braun; for the L.A. artists, Palm Springs and the high desert was much more convenient. Staying in Borrego Springs, a tiny desert town surrounded by the Park, I spent the first three days teaching a workshop with great attendance. Each day presented new locations to explore - and we worked only around the western side of town! Once you get in your car and drive, there are enough hidden canyons and valleys to last a lifetime. We focused on the basics of painting on location, always stressing the importance of good color relationships, emotional impact, and light. We had lots of good conversations and questions about painting, good meals, and covered lots of canvas boards with paint. I was pleased to see a jump in confidence in each person's work from one day to the next, so I think it was enjoyable for all. By the end of the workshop each individual was developing their own approach and personal sense of color. March 8 was the full moon, so this meant perfect conditions for some moonlight painting! No wind, comfortable evening temperatures, and bright moonlight. Everyone should see the desert in moonlight at some point, it's awesome. This photo only gives a sense of what my setup looks like at night, the camera can't pick up the moonlight even from a full moon; yet it produces enough light to walk by without any other light source. The last day of the workshop we drove up the mountains to gain some elevation. Culp Valley turned out to be a fantastic spot, with dramatic views back down to the desert floor amidst ancient boulders and forests of cholla. After the workshop ended and everyone packed up, happily but wearily, to drive home, I had another job in town, so I stayed on. The 6th Annual Borrego Springs Plein Air Invitational began the next day, hosted by the Borrego Art Institute, and I had been invited to judge the event at the end of the week. This meant I had some time to myself to paint, and so I happily disappeared into the desert each day to explore and paint. I was enthralled by day with locations such as Coachwhip Canyon (got stuck in the sand), Earth Narrows Trail (got stuck by some cholla), Font's Point, and others; and devoured stories of desert lore by night - ghostly stagecoaches that rumble by in the dark of the new moon, mysterious ships discovered in hillsides and sand dunes, old stories of lost prospectors and lost claims, shootouts with bandits, De Anza's desert expeditions, Pegleg Smith's legendary black gold, and Indian guides with secrets. At the end of the week, each of the 15 participating artists brought in their work to be juried. This was a tough decision to narrow down, as art is more subjective than sports, but yet there are criteria we can use to begin to judge the merit of an artwork. Saturday night was the reception for the exhibit, and the town of Borrego Springs turned out in numbers to support the Art Institute and exhibition, a wonderful sight to see. Winds and rain did finally come to town on Saturday afternoon, but the weather generously waited out the week so that everyone could get their paintings done. To me, the desert is one of the most mysterious, beautiful and difficult places to paint, so I congratulate everyone who participated in the Invitational. I came home with a dozen or more sketches, and I'm excited to get to work on larger versions of these. *Due to the great response to the workshop, too, I'm planning to do another soon. Maybe returning to Borrego Springs, or heading up to Joshua Tree in the high desert. If you're interested in these, send me an email and I'll keep you up to date. This last one filled up quite quickly. "A Place of Clarity" will be part of the upcoming California Art Club's 101st Annual Gold Medal Juried Exhibition opening March 31, 2012 at a new exhibition venue: The Autry National Center, 4700 Western Heritage Way, Los Angeles, CA 95614 (in Griffith Park). The Artists Gala Reception will open the exhibition on Saturday, March 31 from 6-9 p.m. This was painted at Crystal Lake, one of my favorite new locations to paint in the San Gabriel Mountains, way back up Highway 39 out of Azusa. This area has been closed for about 9 years, since the 2002 Curve Fire which burned much of the area. Crystal Lake is apparently the only natural lake in the entire San Gabriel range, being fed from snowmelt and rainfall. As I painted there over last summer, I did notice the water level drop significantly over the months of warm weather. It's a popular place for fishing, too. This is a special place, and feels more like the Sierras. These kelp-like plants grew very rapidly (kelp is not a freshwater plant, however, so I don't know exactly what it is, but it very much resembles kelp!) Fun to paint them growing out of the watery depths into the sunlight, swaying with the slight breezes over the surface of the water. Here are some old photos of the Crystal Lake area. Also in the exhibition is a small painting of dusk in the Arroyo Seco in Pasadena, looking towards South Pasadena with the last of the sunlight hitting some trees in the distance. These two paintings will be in the upcoming exhibition "SAVING PARADISE" at the Los Angeles Municipal Art Gallery in Barnsdall Park, Los Angeles. This exhibit's theme is to designed to highlight the importance between landscape painting and preservation, so both of my paintings are from protected areas in California - Joshua Tree National Park and Angeles National Forest. I'll be at the Gallery on Friday, March 23 at 7 pm along with some of the other artists to discuss our paintings. Some historic notes: The California Art Club was previously headquartered at Barnsdall Park and specifically used the Frank Lloyd Wright-designed Hollyhock House for 15 years, 1927-1942, so this exhibition marks the first time the Club has been back to Barnsdall Park since then. Read about this slice of L.A. history that is only documented on this blog. I'll be giving a short presentation about my work at 1 pm on Saturday, October 15, 2011 at the Henderson Community Building, 72559 Highway 111 at El Paseo (Entrada del Paseo) in Palm Desert for the 6th Annual Desert Garden Community Day, presented by the Desert Horticultural Society, the City of Palm Desert, and the Desert Garden Center in Palm Springs. The events will be a combination of artists and their work along with workshops about desert landscaping. The Palm Springs Art Museum is not far from there, so stop by and make a day out of it! On Sunday October 16th I'll be exhibiting new paintings of the historic Arroyo Seco along with other artists from the California Art Club. The exhibition will take place from 11:00 am - 4:00 pm at La Casita del Arroyo, 177 S. Arroyo Blvd., Pasadena, CA 91105 [map]. One of the interesting points the exhibit made was the boost given to the artists by two of the most prominent French art critics of the time, Gustave Geffroy (1855-1926) and Octave Mirbeau (1848-1917). Geffroy and Mirbeau both wrote extensively about the two artists and were credited with introducing Monet and Rodin to each other - resulting in a lifelong friendship between the artists, exchanges of artwork ("Belle-Ile," above, was given by Monet to Rodin and is now the collection of the Rodin Museum), and numerous letters between Rodin and Monet. The critics were also responsible for introducing the artists to the renowned Georges Petit Gallery in Paris, where they presented a two-man show in 1889. I thought this really highlighted the importance of writers to an artist's career. What we as artists really need is not exposure en masse but better, well-thought out and carefully selected exposure. With the advent of the internet, blogs, etc., everyone can now have their say - so it takes a skilled writer with something to say - writing about something worth hearing about - to cut through the din. Cheers to all those out there doing that. The grounds at the musée have Rodin's monumental works interspersed throughout; also, one room is dedicated to the work of Camille Claudel (1864-1943), probably Rodin's greatest student (with whom he also had a stormy relationship). Did you know that Rainier Maria Rilke (1875-1926), the great German poet and writer, worked in another room as Rodin's secretary for a period?!? The Musée Rodin is definitely worth a visit on your next trip to the City of Lights. During the week of Sept. 19-23, 2011, I'll be leading a painting workshop in the California desert where we will explore and paint the unique light of world-famous Joshua Tree National Park. Lodging in comfortable and affordable cabins at a rustic B&B in Joshua Tree, CA (5 minutes from the Park entrance), we'll make daily excursions into the Park to paint the different areas of immense beauty. If you've never been to the desert, it is simply spectacular. The more time one spends in the desert, the more it opens itself to you and the more you'll see. And, although it sounds remote, there are plenty of modern conveniences nearby in town. On at least one night we'll venture over to the famous Pappy and Harriet's Pioneertown Palace for dinner in Pioneertown. This is an experience you'll never forget! The temperature averages for September in Joshua Tree range from 97°F during the day to 64°F at night - not too different from Los Angeles at the same time of year. The days will be organized to avoid the warmest part of the day: We'll paint in the morning, take a break during the warmest part, and continue painting in the afternoon. This is also a spectacular time of year for desert sunsets. Limited to 10 students, the workshop is $500 for five full days of painting (Individuals are responsible for accommodations, food, supplies, etc.) Make your reservations today by sending me an email. Check out the different cabins and rates on their website above. The cabins are cozy and comfortable, but if you bunk with a couple of others, it works out to about $180 - $300 for six nights, and the seventh night is free! That's $18 - $42 per night! Please call the B&B directly to make arrangements, and mention that you're part of the painting workshop. This book covers a great range of topics including the history of color usage in art, how artists organize and conceptualize their color, and a whole lot more. I wouldn't be surprised at all is this became a staple in art classrooms. An idea I hear tossed around fairly often about color is that while the morning and evening are great times to paint, during the middle of the day color "flattens out" or "dies." I would like to suggest something entirely different: the color does not go gray, it merely changes. The middle of the day has beautiful color just like any other time of the day, though it may be more subtle than a sunset. Same with an overcast day (see Dan Pinkham's painting below). We can still see the relationships (and hence forms) in nature nonetheless, and since we as humans experience the world in full color (there is no such thing as a gray or neutral in nature's color spectrum, only in your paint tubes and color theory classes) I think it is a greater struggle to attempt to find these subtleties of color. Every plane change is a color change. The issue I have with using terms like "gray," "brown," "neutral," "washed out," etc. is that it starts to get the brain thinking along those lines. Akin to shooting yourself in the foot before starting a race, you need your brain to make a painting - it makes it even harder to find, say, a quiet violet tone (like the top plane of the wrist in Bongart's painting above) if you're thinking of grays. Also, I think this is perpetuated by color being taught too literally, trying to "match" one's paint colors to that of the landscape or your model (see Delacroix quote below). - Every color note that is gray, muddy or chalky is a missed opportunity, and - Every missed opportunity detracts or weakens the overall color of a painting (think of an orchestra or band playing - what if the trumpet or guitar player hit just one sour note! ); - When you put the final spots of color onto a piece, it should all come together and create the sensation of light. The general conception of color seems to imply a high saturation or intensity; i.e., when I say "red," you automatically think of an incredibly bright red, like a sports car. But "red" could also mean a pale violet, made to feel like red by placing it next to a colder color. Look at that warmth in the shadow above in Hensche's still life (and how different it is from the red flower). Painting with color doesn't mean intensity at all - it means painting good relationships. Sorolla used a yellowish-orange to paint that little girl's back - but it relates to all the other colors and reads like sunlight. I think color painting in particular highlights how deficient language can be with describing our experiences. Another note about the images here, check out all the color used to convey "white" - they really aren't white at all, but every color under the sun. The lure of the desert recently bit me again and so I went out to the Coachella Valley to paint with Andrew Dickson, Joe Forkan, Yu Ji and Larry Groff at the Salton Sea and some other great spots in the area. We explored some places I haven't been yet, like Box Canyon and Painted Canyon, hiked to the Dos Palmas Adobe and Oasis, once the home of artist John W. Hilton (who lead quite an interesting life: he was a friend of President Eisenhower, James Cagney, Howard Hughes, and the early desert artists including Nicolai Fechin and Maynard Dixon used to gather at his place for parties - more info on Hilton here and here). We also spent some time painting the surreal landscape of Bombay Beach. In Hilton's words, the desert ". . . is a land of peace, silence and boundless skies …It is as if nature herself set aside these vast areas …so that thinking men might have a place where they go to regain their perspective and find themselves and their true meaning.” From what I understand, the Dos Palmas Adobe has been designated a Historical Monument and is no longer in danger of demolition. In the top painting above I was interested in the composition - the focus on the deep shadow on the left that then moved across the calligraphy of the face of the cliff in sunlight. After I sketched it and made some notes in my sketchbook, the color harmonies brought it all together. The painting below that was a fun challenge - frontally lit with almost no shade save under a bush or two - I had to use subtle temperature shifts to suggest some of the form changes on the hills. If you're in Mecca, make sure to eat at Plaza Garibaldi Restaurant, 91275 66th Avenue, Mecca, CA 92254, 760/396-1500. Some of the best Mexican food I've had in California - you can get a good idea of the quality of a place by their chips and salsa, and these were amazing! Also, homemade tortillas! Here are some new pieces I've been working on, all done on location over a series of days. This is from the area of the Station Fire in the Angeles National Forest/San Gabriel Mountains last year. It's still open to drive through, but it seems like fully half the forest was torched. Eerily beautiful. Lots of strong new growth too. If you're in New York, my exhibit opens today at The Forbes Galleries with an opening reception next Tuesday, July 20 from 6-8 p.m.
"Most Manhattan gallery-goers don’t know the names Jimmy Swinnerton or John Hilton; they can’t tell a smoketree from a cholla. While desert art is expanding its geographic appeal, it hasn’t reached the east coast yet. That transcontinental link may finally be forged, though, with Eric Merrell’s show “No Man is an Island”, opening July 14th at the Forbes Gallery in the lobby of Forbes Magazine headquarters in New York City. The exhibit is a collection of Merrell’s paintings made during an artist’s residency at Joshua Tree National Park in 2009." [youtube=http://www.youtube.com/watch?v=rrkrvAUbU9Y] The author Daniel Pink referenced below in "An American Paradox" talks about the science of motivation, and makes his case explaining why we've moved beyond the Information Age and are now in the Conceptual Age.